Stable litter, chicken and/or cow manure, leaves, hay, straw, silage and spoiled grain, mixed together and composted. Adding compost to soil provides a rich blend of organic matter, teeming with microorganisms. Till compost into garden beds, use it as a topdressing, or mix it into transplanting holes. By increasing soil organic matter and adding all the soil life, nutrients become more available to plants. Improves water holding capacity of soil and soil tilth. To learn more about why adding compost to your soil enhances plant growth, click here. Composted manure, sphagnum peat, perlite, vermiculite, ground limestone and natural soil amendments, including kelp and humates. Approved for use in organic production. Screened to3/4". Use for raising bedding plants and small houseplants. "Preferred by commercial farmers for starting seeds and growing them out. A complete mix. Plants won't need additional nutrients for 4-5 weeks. For a user's guide, read master organic gardener Dave Trumble's article here. Newly formulated for 2019 with Mycorrhizal fungi. Similar to Potting Soil Mix, but screened to 1/4 inch with extra vermiculite. Approved for use in organic production. For assuring that the first roots of sprouting seeds get lifetime fungal partners from the get-go. Mycorrhizal fungi help with germination of salt-tolerant seeds and hinder damping-off disease. A diversity of mycorrhizal fungi will build a network of mycelia when transplanted in the field or garden, which will extend the reach of their roots for moisture and nutrients. Read more about mycorrhizal funghi here. 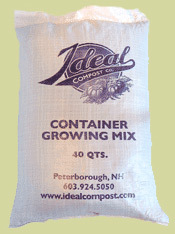 A coarser version of Potting Soil Mix. Ground bark is substituted for part of the peat to improve drainage and increase porosity. Fortified with worm castings to extend fertility. For growing large flower and vegetable plants in containers. Plants will likely require supplemental feeding of fish and/or seaweed emulsion to sustain them for a whole season. Larger proportion of compost than potting soil. Increased porosity promotes root growth. Hot-composted shavings and stable litter. Finer textured than bark mulch. For a 2-3" topdressing on flower and vegetable gardens. Mulch works best for your plants when applied after soil warms up, just before weeds sprout, near the beginning of June. 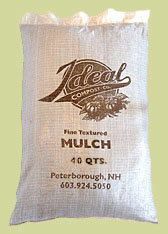 This mulch is fine-textured enough to break down over the course of the growing season, feeding the soil. Attractive, natural appearance. Enhances many award-winning local gardens. Formulated as a ready-made fertile soil for vegetable and flower beds. Can also be used for spot-patching lawns. Garden soil mix based on standard recipe eliminates variability in sources of "loam," "loom", and "topsoil" offered elsewhere. For tips on raised beds, click here.